This is the film that started the long decline of the Alien franchise, but much of the bad feeling this film generates is misplaced, I think. There’s a lot of love out there for the first two films in the series, so any continuation of the story is going to face both closer scrutiny and higher expectations. I don’t believe there is anything inherently wrong with that, so long as opinions aren’t magnified beyond a reasonable consideration of a film’s quality. Luckily for the filmmakers of Alien 3, it was made in a simpler time — the 1990s — when a franchise flick wasn’t judged with any sort of finality before it was even released. Alien 3 hails from 1992, and was director David Fincher’s first feature film. He worked from a screenplay cobbled together by David Giler, Walter Hill, and Larry Ferguson, after the project had been bouncing around in development since shortly after Aliens hit it big at the box office. At one point, sci-fi legend William Gibson was hired to write a script by Giler and Hill (who also served as producers on the film). Gibson’s script was wildly different from what was eventually filmed, so much so that he received no writing credit. For the curious, Gibson’s screenplay can be found online. More writers were hired, including David Twohy, more screenplays were turned out, more revisions were made by committee, and what finally landed in Fincher’s lap was a bit of a mess. Giler and Hill, although neither sat in the director’s chair, kept the bulk of the creative control for this film, placing their young director under much more scrutiny than what either Ridley Scott or James Cameron endured. The result is a film that feels at times just as tedious as the meetings that dreamed it up. In Fincher, Giler and Hill found a meticulous storyteller who would go on to become one of the best directors working in the business today. But that’s not what the producers wanted. They wanted someone to make their film, not stretch their legs and put together something as special as the first two films. Honestly, Hill should have just directed this damn film himself and saved Fincher the headache. However, despite so much control taken away from Fincher, it proved impossible to completely neuter such a talented filmmaker. Fincher’s attention to detail is astounding. At no point in any of his films are sets and lighting not top of the line. His creative team in this film was headed by Alex Thomson (cinematography), Norman Reynolds (production design), Fred Hole and Jim Morahan (art direction), and Belinda Edwards (set decoration). They and their teams did excellent work that surpassed the quality of the final product. Readers will notice that I left the f/x team out of my above praise. That’s because the f/x in Alien 3 is weak. The practical effects are just fine. The animatronic alien is slimy and frightening, just like always. But the bulk of the creature’s appearances are CGI, and it looks bad. The fundamentals are just poor. When the CGI alien is composited into a shot, it fails to integrate, always appearing as pasted on. The CGI team tried to incorporate the low, sodium-tinged lighting of much of the film, but the end result is an alien with a sheen like a copper penny in firelight. The CGI alien is of such poor quality that it, as much as the interference of the producers, is responsible for this film’s problems. So, the film looks great, except for the CGI alien. What about that Frankenstein’s monster of a script? 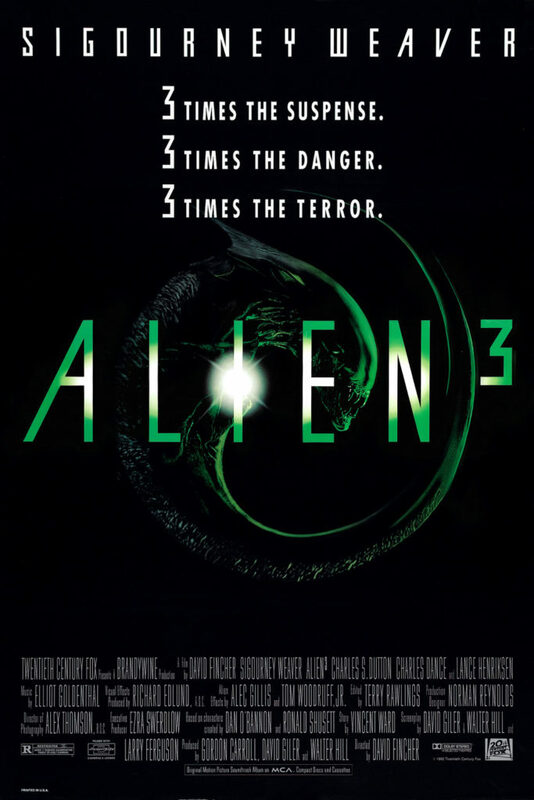 Alien 3 picks up where Aliens left off, but resolves any story threads that might still be left hanging by killing off two main characters before the opening credits are done, and leaving a third spending most of the film on a junk pile. All that’s left is Sigourney Weaver’s Ripley. Her character has been reset to zero, and she finds herself marooned on a remote prison planet, home to a small enough number of prisoners and staff to keep the story from getting out of hand, but enough for the alien to keep busy killing. Two notable members of the cast alongside Weaver are Charles Dance as the resident, dour doctor, and Charles S. Dutton as Dillon, a prisoner and spiritual leader who is as much the film’s driving force as Ripley. A little acrobatics, as seen in the opening montage, ensures that Ripley isn’t the only survivor of the crash that stranded her on the prison planet. An alien has arrived, as well. Only one, as the series returns focus more towards horror and suspense in lieu of action for this entry. The alien wreaks its havoc, and Ripley and the prisoners have little recourse, because there is nary a weapon to be found in the entire prison. The concepts behind the film are not that bad, although a more creative screenwriter should have been able to find a less clumsy way of shoehorning a small cast into an environment conducive to the alien’s killer ways. As if the alien were not enough of a threat, this film wastes time exploring the nefarious Weyland-Yutani corporation. They want the alien captured for research purposes, while Ripley has never wanted anything more in her life than a pile of dead aliens at her feet. The corporate menace in these films has always been unnecessary, and never more so than in Alien 3. That’s a whole lot of criticism from this reviewer, after I suggested being overly critical of the film is a bad idea. Most of that comes from comparing this film unfavorably to what came before. But on its own, Alien 3 is a decent film. It’s just far too obvious that a better film was ready to be made, but Giler and Hill wouldn’t allow that to happen.